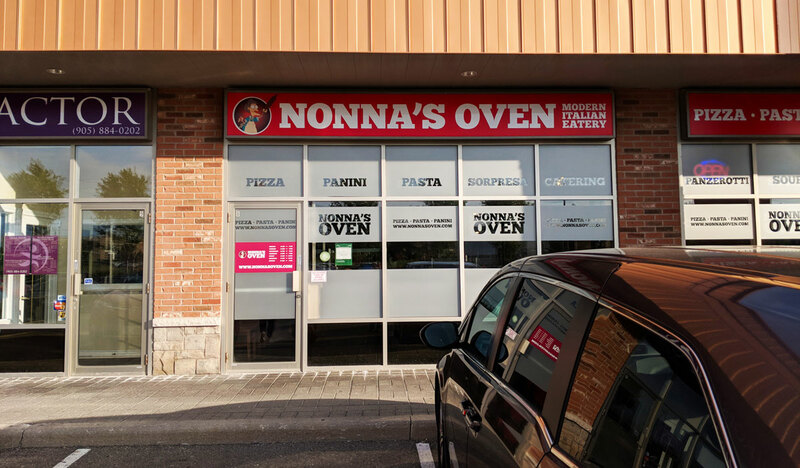 Nonna’s Oven is an Italian joint specializing in pizza (they also have pasta and sandwiches, though the pizza seems to be the main attraction) with locations in Richmond Hill and Oakville. It’s not bad, but it’s probably not worth going out of your way for. 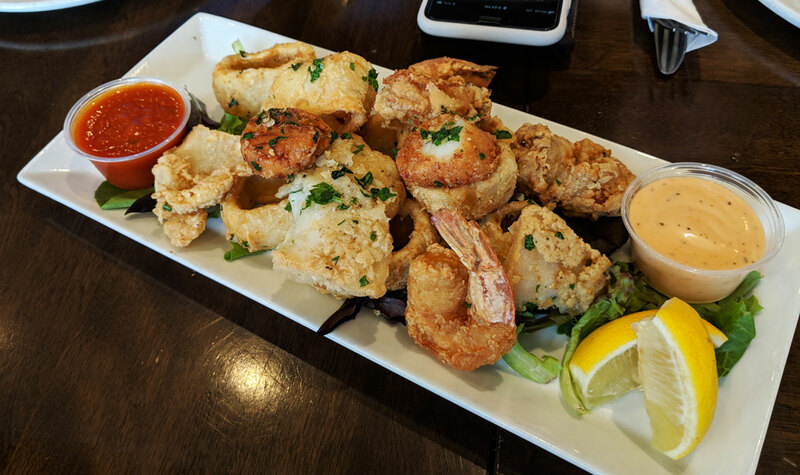 We started with the frittura mista — a plate piled high with deep fried chunks of calamari, cuttlefish, shrimp, scallops, and whitefish. This was mostly pretty good, though the squid was rubbery (everything was a bit overcooked) and the cuttlefish had an unpleasantly fishy funk. Still, it’s hard to go wrong with anything that’s battered and deep fried, especially when the batter is as light and crispy as it is here. The pizzas were a bit of a mixed bag. 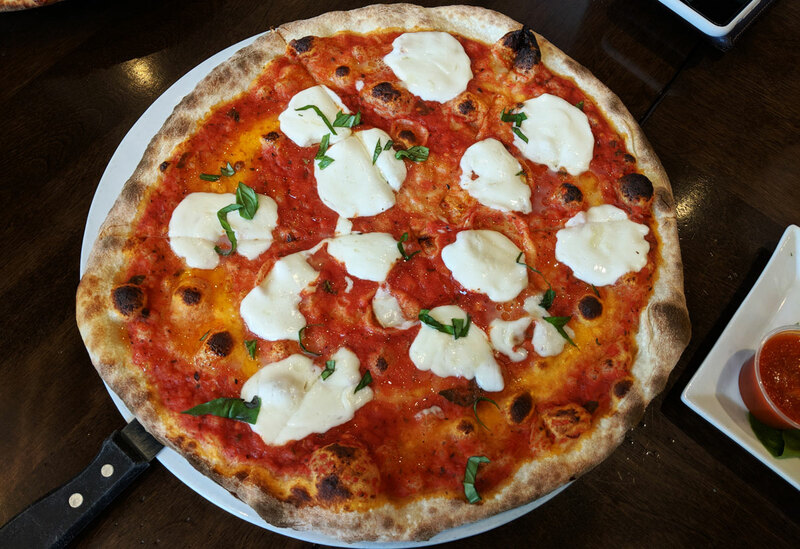 The first was the Margherita Italiana (“homemade tomato sauce, topped with fior di late cheese, fresh basil and light drizzled olive oil”). The thing about a margherita pizza is that it’s so incredibly simple that if all the elements aren’t on point (the crust in particular), then it’s not going to be particularly good. And the crust is definitely an issue here; it’s ultra thin and crispy, with absolutely no substance outside of a crispy crunch. It’s basically like eating tomato sauce and cheese on a really bland cracker. It’s not great. 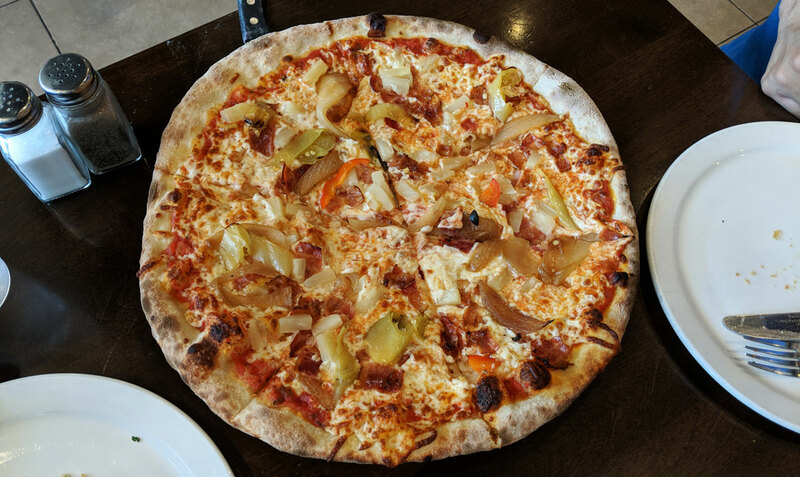 The Hawaiian Inferno pizza (“pineapple, bacon, onion and hot banana peppers”) was definitely the better of the two. The more cheese- and topping-heavy pizza helped to compensate for the bland, crackery crust, and the toppings all worked pretty well together. In the case of both pizzas, the real MVP was the jar of fiery chili oil they had on the table. It had little bits of hot peppers, and if you got a heaping spoonful of the peppers and the oil, it really kicked things up and helped to make everything a bit more interesting.